President Donald Trump has fired the director of the FBI over his handling of the inquiry into Hillary Clinton's emails, the administration says. The White House shocked Washington by announcing that James Comey "has been terminated and removed from office". The move came as it emerged Mr Comey gave inaccurate information about Mrs Clinton's emails to Congress last week. President Trump wrote in a letter to Mr Comey that he agreed with US Attorney General Jeff Sessions' recommendation that "you are not able to effectively lead the Bureau". Mr Sessions said the Department of Justice was "committed to a high level of discipline, integrity, and the rule of law", and "a fresh start is needed". The White House said the search for a successor would begin immediately. Mr Comey was addressing FBI agents in Los Angeles when he was handed a note by one of his team informing him he had just been fired. The 56-year-old - who was four years into his 10-year term as FBI director - reportedly laughed, thinking it was a prank. 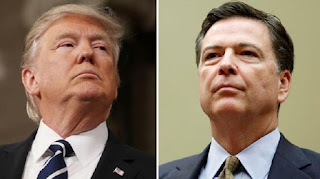 Many have expressed surprise that Mr Comey should be fired for his handling of the Clinton emails investigation, given that Mr Trump formerly praised the FBI director's conduct in the matter. In the final days of the presidential campaign, Mr Trump told a rally it "took guts" for Mr Comey to reopen the inquiry. "What he did brought back his reputation," Mr Trump said. But on Tuesday, Deputy Attorney General Rod Rosenstein said he "cannot defend the Director's handling of the conclusion of the investigation of Secretary Clinton's emails, and I do not understand his refusal to accept the nearly universal judgement that he was mistaken". "Almost everyone agrees the Director made serious mistakes; it is one of the few issues that unites people of diverse perspectives". He said Mr Comey had been wrong to "usurp" the previous attorney general in July 2016 to announce the Clinton emails inquiry should be closed without prosecution. The deputy attorney general said Mr Comey compounded his error by "gratuitously" releasing "derogatory information" about Mrs Clinton. The House of Representatives and Senate intelligence committees are investigating the same allegations. "Were these investigations getting too close to home for the president?" Senate Minority Leader Chuck Schumer asked a Tuesday evening press conference. "This does not seem to be a coincidence," he added. And it is not just Democrats who expressed concern. Richard Burr, the Republican head of the Senate Intelligence Committee, said: "I am troubled by the timing and reasoning of Jim Comey's termination." The development is drawing comparisons with the so-called Saturday Night Massacre of 1973, when President Richard Nixon fired an independent special prosecutor investigating the Watergate scandal. But President Trump has repeatedly insisted the Russia allegations are "fake news". 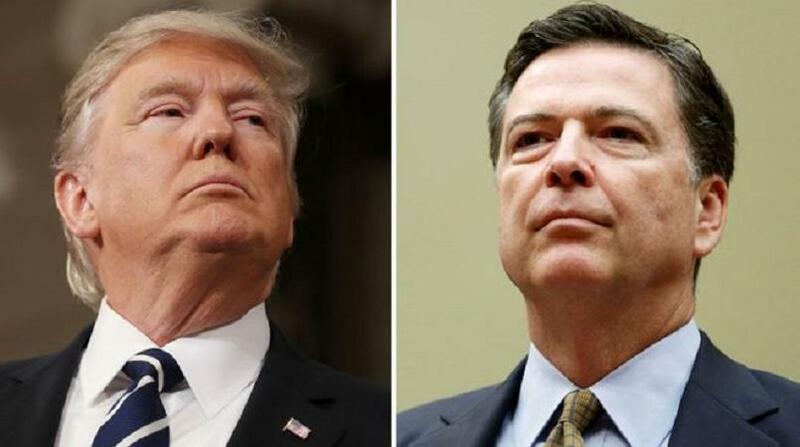 Donald Trump and senior Justice Department officials are framing the firing of James Comey as a result of his botched investigation into Hillary Clinton's email server. They do so using language that even Clinton backers would probably support. Democrats, to put it bluntly, aren't buying it, however - not from this White House. They are dismissing this Clinton explanation as a smokescreen, and view the suddenness of the move as an attempt to subvert the ongoing FBI investigation into possible ties between Russia and the Trump campaign. At the very least, their calls for an independent investigation into the matter will become deafening - and some Republicans may now be inclined to agree. The president didn't help his cause by specifically asserting that he was "not under investigation" in his letter to Mr Comey. Already Democrats are clamouring for the ex-director to testify before Congress about the state of the FBI's Russia investigation at the time of his dismissal. Just days after becoming president, Mr Trump shook Mr Comey's hand at a White House event and said "he's become more famous than me". That may have been an exaggeration at the time. It seems less like one now. How did Comey handle the email inquiry? Mr Comey has been criticised by Democrats for the handling of his investigation into whether Mrs Clinton's use of a private email server when secretary of state compromised national security. He said in July the case should be closed without prosecution, but then declared - 11 days before November's election - that he had reopened the inquiry because of a discovery of a new trove of Clinton-related emails. He told the Senate last week it made him "mildly nauseous" to think his intervention could have affected the election, but insisted he would make the same decision again. Mrs Clinton blames Mr Comey for her shock election defeat last November to Donald Trump. What was inaccurate about Comey's testimony? Mr Comey told the Senate Judiciary Committee on 3 May that Mrs Clinton's top aide, Huma Abedin, had forwarded "hundreds and thousands" of emails, "some of which contain classified information", to her then-husband. But the FBI conceded on Tuesday that Ms Abedin had only sent two email chains containing classified information to her husband, Anthony Weiner, for printing. The clarification was made in a letter from the FBI's assistant director of congressional affairs, Gregory Brower, to the congressional committee. The majority of the 49,000 emails investigators uncovered on Mr Weiner's laptop were transferred via automatic backup of her work Blackberry device, Mr Brower wrote. Ultimately, all 12 classified email chains found on Mr Weiner's device were duplicates that had already been reviewed by investigators.